Japan were involved in an enthralling clash with Belgium on Monday night, as Genki Haraguchi and Takashi Inui stunned Roberto Martinez’s men in the second half. Both sides had their moments in the opening 45 minutes as both were willing to attack in numbers and in turn that led to an entertaining encounter despite it being goalless at the interval. 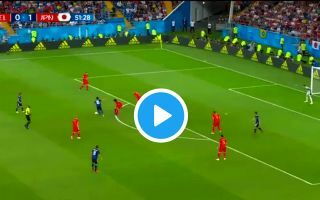 However, it all changed after the break as Haraguchi and Inui found the back of the net in just four minutes as Belgium were left shell-shocked. Given the technical quality and confidence on the ball from Japan, they were always going to be a threat to Belgium. Nevertheless, few would have been expecting such a thrilling impact in the second half to leave one of the tournament favourites on the ropes. Inui’s goal undoubtedly stood out though, as he angled his long-range strike past Thibaut Courtois and into the back of the net, as seen in the video below. Given there was just 256 seconds between the two goals, it gave Belgium no chance to recover from the first setback as Japan took a major step towards qualifying for the 2018 World Cup quarter-finals.